Manufacturer and supplier of Industrial Hoses such as Rubber Air Hose, Rubber Water Hose, Rubber Car Washing Hose, Rubber Water Suction Hose, Rubber Rock Drill Hose, Rubber Petrol Hose, Rubber Chemical Hose, Rubber Oil Suction Hose, Rubber Welding Hose and Rubber Carbon Free /Cable Coolant Hose. We offer different types of Industrial Heavy Duty Hose. These hoses are designed for heavy duty water suction and discharge service, where rugged yet flexible hose is required for both dewatering and delivery purposes during excavation of mines, project construction, offloading operation and for handling sewerage, waste water and mud. If the liquids are non-corrosive and do not carry solids in suspensions, as in the case with muddy water, rough bore is used; in other cases smooth bores are used. 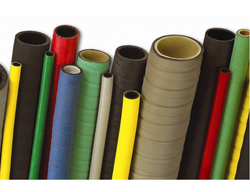 We are engaged in providing a wide range of Industrial Flexible Hose. These are made from high quality raw material. These are provided in different specification to meet the diverse requirement of client. Transparency has been maintained in our each and every business dealing, which has given us a reason to do repeated business with our valued clientele. PLCW One layer of cotton braid, covered outside with G.I. wire braiding for additional pressure. Our client can avail from us a wide range of Industrial Hose. These are made from high quality raw material. These are provided in different specification to meet the diverse requirement of client. Recommended for all air and water applications requiring maximum flexibility in engineering industry, workshops, shipyards, irrigation etc. For dewatering and delivery purposes during deflooding, handling for waste water, sewerage. W.P. of 0.7 MPa & min. B.P. of 2.1 MPa . We are instrumental in offering our clients a high quality range of Industrial Vacuum Hose. 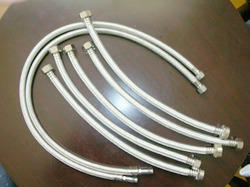 The offered hose is meticulously tested on various quality parameters and is widely demanded in dairy fittings. Offered hose is manufactured by utilizing optimum quality raw-material and the latest technology by our experts. 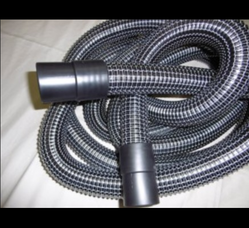 In line with industry standard we provide this hose in various customized options and at affordable prices.